We created this Where to Stay in Beijing guide in collaboration with Sophie Williams, a journalist and travel blogger who focuses on China. We’re happy she’s agreed to share her passion and knowledge of Beijing as our local city expert for this Where to Stay in Beijing Guide. Note: We also have a Where to Stay in Shanghai Guide, if you’re planning a larger trip around China! Taking a trip through the Chinese capital of Beijing is like stepping through time. When I first moved to Beijing, I spent hours exploring each neighbourhood as I came to grips with and began to understand the city. Beijing may be home to 21 million people, but if you take a turn down one of the city’s many alleys, you’ll feel like you’re in a village. Indeed, walking around the city is the best way to truly get a feel for Beijing’s culture. When friends come to visit me in Beijing, there are often several areas they’ve heard about and want to see and experience for themselves. It is always exciting taking them to places I had found by myself that weren’t necessarily in the guide books. And I’m happy to be able to share that knowledge with others through this post. Wangfujing: If you want to be central or stay in a bustling part of the city, Wangfujing is one of the best areas to stay in Beijing. Home to a shopping mall, a pedestrian street full of shops and restaurants, and a street food road lined with all sorts of snacks, it’s hard to get bored in Wangfujing. Wangfujing is also well located for visiting Tiananmen Square and the Forbidden City. One of the best place to stay in Beijing for first-timers! 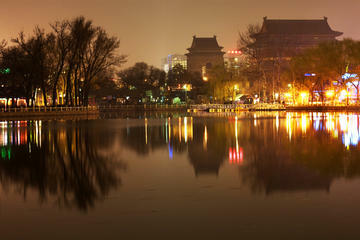 Qianmen: Centrally located just south of Tiananmen Square, Qianmen might be the most convenient area to stay in Beijing. Foodies will love the mix of traditional Chinese restaurants serving Peking duck and the spicy halal dishes, which play an important role in Beijing cuisine. People visiting Beijing for the first time will love its proximity to Tiananmen Square and the Forbidden City. Indeed, Qianmen is another one of the best areas to stay in Beijing for tourists, especially if it’s you’re first time in the city. The only challenge with Qianmen is the lack of excellent hotels, but we’ve picked out some good bets. Sanlitun: Sanlitun is quickly becoming one of the trendiest neighborhoods in the city, and is a best place to stay in Beijing for a hip, urban, and international vibe. The mix of hipster coffee shops, embassies and a young and artsy crowd creates a neighborhood with an international vibe where it’s a pleasure to walk around. Sanlitun is also one of the best areas to stay in Beijing for nightlife. Gulou / Nanluguoxiang: Gulou and Nanluguoxiang are up-and-coming areas that offer everything you need if you want to avoid staying in a touristy area. A good mix of eateries and cafès, vintage clothing shops and historic alleyways and courtyards make it a nice place to get lost. When the weather’s nice, it’s great to head to the nearby lake and relax with locals. There are also some lovely boutique courtyard hotels in this part of town! 798 District: 798 District is home to some of Beijing’s best art galleries and exhibitions, and if you’re into street art, it’s the place to be. You can also take your pick of many quirky cafès and shops. Where to Stay in Beijing: A summary for those of you who can’t decide! How to Get Around Beijing: Tips for getting from Beijing airport to the city centre, and for getting around the city. What if You Don’t Speak Mandarin? Do you need to speak Chinese to visit Beijing? Tips from Sophie. A Note About the Hotels in This Guide: How we selected the hotels in this guide. Planning a trip to China? Be sure to check out our Where to Stay in Shanghai guide while you’re here! Wangfujing is usually a hit with tourists looking to stay in central Beijing. It’s right in the middle of the city along subway line one and is well connected to many other subway lines. It’s also a good place to be located if you want to spend some time at the Forbidden City. Wangfujing is one of the busiest shopping areas in the city thanks to the Wangfujing pedestrian street. If you’re feeling a bit lost, check out the giant shopping mall with a food court that serves both Western and Chinese dishes. Many also have English menus. In the narrow streets around the shopping area, the brave can try scorpions, snake, starfish and other treats on Wangfujing Snack Street. The less brave can also pick up fruit kebabs, candy floss and bubble tea along with the more traditional dumplings. Wangfujing also has a wealth of hotels to choose from, which helps to make this one of the best areas to stay in Beijing. Beijing Red Wall Garden Hotel Wangfujing – A 40-room boutique in a historic Hutong, the Red Wall Garden offers traditional-style rooms with modern amenities. Previous guests mention the tranquil garden ambience, location and helpful staff as the stand-outs of this property, as well as the live traditional music. There’s a courtyard bistro, on-site bar, and traditional tearoom on site for nourishment. The hotel is a 5-minute walk from Dengshikou subway station, and 15- to 20-minutes walking to Tiananmen Square. Beijing 161 – A top-seller in this neighborhood, Beijing 161 is all about value for money. With a very cute and cozy look, rooms are clean and simple, with ensuite bathrooms, air con, and cable TV. Past guests appreciate the clean rooms, location close to a metro, and value of this property. About a 15-minute walk to Wangfujing pedestrian street, 40 minutes on foot to Tiananmen Square. You can also rent bikes from reception, or take the metro: Dongsi Metro is a 4-minute walk, and Dengshikou is 7 minutes on foot. Peking Station Hostel – Tucked away in an old-fashioned courtyard, this affordable and cosy hostel is perfect if you’re looking to meet some people, save a few kwai, or do a combo of the two! Previous guests mention the warm atmosphere and nice decor (there are fresh flowers everywhere!). Both dorms and private rooms are available, and it’s located just 4 minutes’ walk from Dongdan subway (two stops from the Forbidden City). In other words: a great and affordable option for exploring Beijing. Waldorf Astoria – Ranked as a Top 15 Beijing hotel, the Beijing Waldorf Astoria lives up to its luxurious brand and appears to be a guest favorite. Offering a modern-luxury take on traditional Chinese decoration and design, the property is sophisticated down to the very last detail. Expect marble bathrooms stocked with Ferragamo toiletries, tablet-controlled rooms, and Apple TV connected flat screens in the elegant rooms. The hotel offers an on-site spa, gym, swimming pool, 2 restaurants and a cocktail bar. 5-minute walk from Wangfujing Pedestrian Street. Hotel NUO Wangfujing – Channeling French-Orient architecture and interiors, this hotel blends European and Chinese luxury to create a sophisticated, beautiful experience. Expect a lovely traditional look with grand spaces, antiques, and chandeliers throughout. Hotel NUO offers an indoor pool, spa, and gym, as well as 2 on-site restaurants and a bar. Recognized as a Top 100 hotel worldwide in 2012, Hotel NUO is elegant, old-world luxury. Just a 5-minute walk from Tiananmen Square, and just a few minutes from Wangfujing metro stop. If you would prefer the privacy of an apartment, or want the amenities of being at home, this area of Beijing has a few good apart-hotel options. The Imperial Mansion Beijing – Marriott Executive Apartments (8.6 / 10 on Booking.com) – This condo offers luxury accommodations and great amenities, including a washing machine and dryer, fully functional kitchen and elegant marble bathrooms. Previous guests loved the elegant interiors and the staff’s helpfulness. Located near the Wangfujing metro station, most tourist sites are just one stop away. Lee Garden Service Apartment (8.8 / 10 on Booking.com) – Offering great views of the city, this condo combines the luxury of a 5-star hotel with the convenience of an apartment. Each apartment comes standard with superior fittings, a full kitchen, and a washing machine. Other amenities include a gym, indoor pool, sauna, and cafè. The condo is right off Wangfujing Street. Qianmen district is one of the best areas to stay in Beijing for a first-time visitor, or when you first arrive and are coming to grips with the city. Most of the hotels in this area lean more towards the “affordable” end of the scale, with a few upscale and luxury properties to choose from. Its location, just south of Tiananmen Square, means that it’s busy and convenient, and only a short walk from some of the capital’s main sites, including Mao’s Mausoleum and the Chinese museums. It’s also one of the city’s main foodie areas, making it a great place to try Peking Duck. Many of the restaurants in Qianmen are famous for their Beijing Duck, and hang photos on their walls of all the celebrities that dined on the dish at their establishment. Qianmen is also in the middle of one of the main Muslim districts in Beijing, meaning you can get excellent spicy Halal dishes, such as beef and onions with rice. The local Niujie Mosque is also worth a visit, as it’s believed to be the oldest and biggest in China. If you don’t know any Mandarin or are still learning the basics, the restaurants in Qianmen make it easy, because they have pictures on the walls of the dishes. All you need to do is point at the one you want! New World Beijing Hotel – A 5-star hotel with muted, elegant interiors, this modern property offers comfortable rooms, top-notch amenities, and great on-site dining and wellness facilities. Past guests mention the spacious and well-appointed rooms, and lovely marble bathrooms as standout. The indoor pool and spa, fitness center, and two on-site restaurants and rooftop bar ensure you have everything you need on-site. A 15-minute walk from Tiananmen Square, and 10 minutes from the Temple of Heaven and the busy Wangfujing Street. The Emperor Beijing Qianmen – A design hotel with a tranquil, zen-like ‘water’ theme throughout all the interiors, this 5-star features a (glass-edged) rooftop pool, spa facilities and fitness gym, and an on-site restaurant and rooftop bar. Rooms are uniquely designed and feature coffee and tea facilities, air conditioning and beautiful bathrooms with a shower, bath tub and L’Occitaine toiletries. Located within the bustling Xianyukou Hutong, the area is full of local shops and eateries, and is about 10 minutes from Tiananmen Square on foot. Pentahotel Beijing – Decorated in soothing, neutral shades and featuring an on-site cafe, noodle bar, and lobby lounge for cocktails and socializing, this 4-star hotel is trendy and centrally located. Air-conditioned rooms offer a living area and flat-screen TV, but make sure to ask for a non-smoking room! While the rooms have a bit of a business hotel feel to them, the lobby and common area seems more vibrant. Located in Beijing’s business district, the hotel is just a 2-minute walk from Chongwenmen Metro Station, or you can walk to Tiananmen Square in about 25 minutes. Qianmen has a wealth of budget hotels, guest houses and hostels to choose from, but not all get rave reviews from past guests. If we were travelling to Beijing on a budget, and wanted to stay in Qianmen, we’d look at staying at either 365 Inn or Leo Hostel. 365 Inn (8.4/10 on Booking.com) — A hostel offering a mix of private rooms and beds in dormitories, 365 Inn has a ‘home away from home’ vibe, with a homey look and feel to the rooms and common area. Walking distance to Tiananmen Square, close to a metro, with helpful staff and an affordable price makes a winning combo. Leo Hostel (8.1/10 on Booking.com) — Offering mostly dorm rooms with a few privates available, Leo Hostel has funky decor that mixes traditional Chinese touches with a fun, international feel. There’s an onsite bar that gets good reviews, and past guests say the staff and location are both great. Sanlitun has become more well-known over time. If you’re looking to explore the capital’s nightlife, this is the place to be. The city’s coolest artsy types all meet at Sanlitun to shop, drink and catch up with some good coffee. Photographers are known to hang around to capture the trendiest outfits for China’s big fashion magazines. Sanlitun is also home to many embassies, giving it a great international feel. Most of the food and drink outlets are centred around Sanlitun village – a giant mall made to feel like a small outdoor town. There is also a small square opposite that is home to the Bookworm, which holds interesting cultural events every week that discuss Chinese politics with both international and local figures. If you’re looking to stay in one of the city’s trendiest areas, then Sanlitun is one of the best areas to stay in Beijing. It’s also well connected via line two of the subway system, which joins with many other major lines. The Opposite House – Offering gorgeous, minimalist rooms, bright and airy interiors, and stunning common areas, it’s hard to go wrong with this 5-star hotel: ranked by travelers as the 3rd-best hotel in the city. The spacious rooms offer natural materials, floor-to-ceiling windows, sumptuous furnishings and luxurious bathrooms with both a bathtub and rain shower. Guests can take advantage of an indoor pool and a wellness center, and the area around the hotel offers many trendy restaurants and boutiques. Located about equal distance between Tuanjiehu and Agricultural Exhibition Center metro stops. CHAO Sanlitun – A 5-star property exuding tranquility and modern minimalism, the CHAO offers a highly-rated and elegant option in one of Beijing’s coolest neighborhoods. The monochrome rooms are bright and spacious, and past guests love the cleanliness, friendly staff, and consistent branding throughout this property. The CHAO offers multiple food and drink options, as well as on-site fitness and swimming. Just a 13-minute walk to Tuanjiehu metro stop, with loads of food, drink and shopping options nearby. Sanlitun Mark Jacobs Boutique Hotel – This bright, bold and eclectic hotel excels at quirky design with an affordable price. Uniquely designed rooms, with bright colors and special details such as round beds and design showers, make this hotel stand out. The very unique rooms are all equipped with flat-screen TVs, cable channels, slippers, and bathrobes, although past guests mention they’re quite dark. Located in a convenient location for food and shopping, it’s a 9-minute walk from Agricultural Exhibition Center metro stop. You can also rent a bike from hotel reception. Holiday Inn Express Beijing Dongzhimen – This 4-star chain hotel offers nice-sized rooms ideal for both leisure and business travelers. The air-conditioned rooms feature tea and coffee-making facilities, an iPod dock, and a sofa. 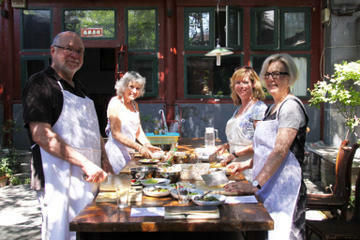 Previous guests loved the (always included) breakfast with plenty of Asian and Western food choices. The hotel is a 15-minute walk both to Dongzhimen station, where the airport express metro stops, and the Sanlitun main area, which is full of bars and shops. Swissotel Beijing – A 4-star property that’s admittedly a bit dated, this place seems to offer good bang for buck if you’re looking to stay with an upscale brand, with more of a 3-star price. Although rooms are in need of a slight refresh, they are clean, comfortable, and spacious, with comfortable beds and (some) nice city views. An on-site pool and spa and tennis courts are available, and the hotel has 2 restaurants and a bar. Very close to Dongsi Shitiao station, and walking distance to many bars and restaurants. New Oriental Suites in Seasons Park – Well-equipped studio apartments within a large complex, these studios are a great option for anyone who wants the privacy of an apartment, or the convenience of laundry and kitchen facilities. Past guests describe the kitchens as limited but functional for short stays, but don’t expect a fully equipped gourmet kitchen. The apartments are a 10 to 15-minute walk from Dongzhimen subway station, and about 20 minutes walk from the heart of Sanlitun. Gulou and Nanluguoxiang are known as Beijing’s up and coming areas. They’re the places where locals flock to purchase both vintage clothing and items from young designers beginning to make their mark on the capital. The areas are centred around the city’s bell tower, meaning you’ll get to see some historical sites too. In its time, the bell tower warned people of approaching invaders. The area is made up of Hutongs, or alleyways made out of courtyard residences. Because of this, there are many surprises to be had when browsing the shops. To find the best ones, you’ve really got to wander around and explore. The neighbourhood has a bit of everything for eating out. Around the bell tower, there are some great Asian/Western fusion restaurants that offer Asian tacos, etc. There are also some excellent bars frequented by locals. Temple Bar hosts many good local bands who play on most evenings. The area is also home to one of the biggest lakes in the city, which is lovely to walk around in summer. In winter, it’s turned into an ice rink. If you really like this kind of feel to a city, I would definitely recommend staying here. Han’s Royal Garden Boutique Hotel – Offering traditional Chinese elegance at its most luxurious, Han’s Royal Garden offers top-notch guest service and facilities in a beautiful package. Think red lacquer, rich woods, delicate screens, and beautiful silks. Previous guests loved the traditional style paired with high-end modern amenities, as well as the beauty of the courtyards and koi ponds. The hotel’s other facilities include 5 different restaurants and a spa. Nanluoguxiang Subway Station is just a 5-minute walk away. LeZaiNanLuoBoutique Hotel – Combining traditional architecture and hints of the past with a fresh and modern look, this property is part of the Beijing 161 courtyard hotel chain. Rooms have a bit of spa vibe, offering bright and airy spaces decked out in natural materials and high-quality furnishings. If you’re there in nice weather, be sure to take advantage of some of the lovely outdoor spaces. Within walking distance to bars and Beijing Hutong. Shichahai is the closest metro stop. Nostalgia Hotel Beijing Confucius Temple – A good option if you want to save your cash for sightseeing rather than sleeping, this property offers simple but comfortable accommodation at affordable rates, creating a good value choice in the heart of the city. Each room comes standard with a kettle, slippers, and several nice touches, such as complimentary water and yogurt drinks. 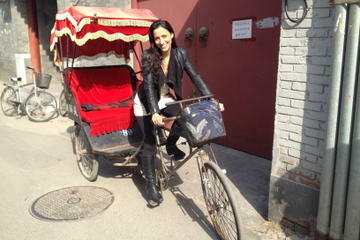 Located in the middle of the Hutong area, the hotel is a little difficult to find. Make sure you print out the directions in Chinese so you can ask for help! 798 district is located slightly further out of the city, but it’s a great place to spend time if you’re into street art and want to get involved in the local scene. The area has become so widely known that famous artists such as Ai Weiwei and Yoko Ono have had incredibly popular exhibitions here. It’s also home to resident artists, including a North Korean company that bizarrely sells North Korean collectibles. Just like in Gulou, there are plenty of kitsch cafes and bars offering western dishes. I would personally recommend Xiao Wan Shi Tang, the original restaurant in 798 district famous for its Hunan, Hubei and Sichuan food. One downside about this area is a lack of great hotels, with one exception: NUO Hotel Beijing gets rave reviews from past guests, and is the fifth-highest rated hotel on TripAdvisor (according to past guests). Wangfujing and Qianmen are the best areas to stay in Beijing for tourists visiting the city for the first time, who want to be within walking distance to Tiananmen Square and the Forbidden City. Qianmen is closer, but doesn’t have as wide a range of top Beijing hotels to choose from, with most of the accommodations in the area skewing towards budget travellers. Wangfujing has a wide variety of hotels, restaurants, and shopping, making it one of the best areas to stay in Beijing for all types of travellers! Sanlitun is the best area to stay in Beijing for nightlife, and for travellers looking for an upscale and hip urban part of the city. For traditional accomodation and experiences, look elsewhere. But for modern, urban and cool, Sanlitun is the best area to stay in Beijing! Gulou and Nanluguoxiang are the best areas to stay in Beijing for travelers who want to stay somewhere relatively central and convenient, but want more of a taste of local living and traditional Beijing. Filled with winding Hutong alleys and courtyard hotels, there are some lovely boutique hotels in this part of the city, hidden away from most other tourists! 798 District is the artsiest part of Beijing, filled with galleries, art spaces, and street art. There are limited hotels here (we’ve listed one of the best), and it’s a bit far out of the centre. For most travellers, this is a cool place to visit in Beijing, while staying in Sanlitun or Wangfujing. There are two major airports in Beijing. If you’re flying from an international destination, you will land at Beijing Capital International Airport. Smaller and budget flights land at Beijing Nanyuan Airport, which is situated further south of the city. Beijing Capital International Airport is the more convenient of the two, as it has bus and subway links directly to the heart of the city. The Airport Express subway line takes you from the airport to Dongzhimen, which has good links to the rest of Beijing’s subway lines. If you’re arriving on an overseas flight and don’t want to deal with public transport, it’s possible to book an airport transfer in advance. If you arrive at the Beijing Nanyuan Airport, it may be more convenient to take a taxi into the centre of the city, or book an airport transfer. Once you’re in the city, the subway system is quick and convenient, making it the best way to get around. Beijing doesn’t offer day tickets, which means you have to purchase a ticket for every journey. The tickets are priced by distance, with the cheapest ticket costing 2 yuan and the most expensive 8 yuan. Riding the subway during rush hour can be quite an experience, and you’ll quickly learn to take all of the available space given to you and the joy of having elbows! Buses are also convenient, but be sure to have the correct change on you when you board, because drivers cannot hand over change. Is It a Problem if You Don’t Speak Mandarin? Nowadays, Beijing is an international city, and it won’t be difficult to find people to help out if you’re in need of a hand. If you want to visit a specific place, it might be worth printing out the characters in Mandarin so you can show people if you get lost. Taking a taxi can also prove tricky, because most drivers don’t speak English, so once again print out the address in Mandarin or ask a member of hotel staff to write it down. Ordering food is relatively easy, and most people are incredibly friendly and willing to help you. Our hope with this Where to Stay in Beijing Guide is to make it easy to find the best area to stay in Beijing for your particular travel style, goals and budget. 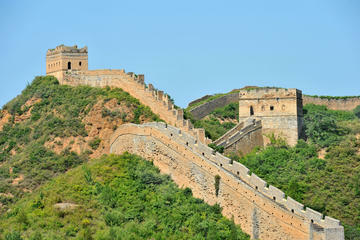 Beijing is a very big city, and it’s worth figuring out where you want to base yourself and where you want to explore! Since we hired a local to write this guide, we’re a bit limited in terms of hotel knowledge, because, of course, locals don’t live in hotels! So, we’ve gone through and chosen some of the highest rated hotels and apartments in each neighborhood. Basically, we did the research for you and chose the places we personally would like to stay and the places we felt we’d be comfortable recommending to a friend or family member, across different budget ranges. We would like to help you have a fantastic vacation to Beijing and China, no matter if it’s just a short break or a long trip. And, we want you to be able to do so without spending hours on the internet, reading reviews and cross-checking locations on a map. Hopefully we’ve succeeded…but please don’t blame us if we haven’t – we expect you’ll check the most recent reviews and specific conditions in the city, using our listings as a starting point and framework, and then select the best hotel and area to stay in Beijing for your own trip!